This month is a little complicated because there is a budget within the budget. We knew the trip to Alaska would be costly. We didn’t know exactly how costly, but I estimated roughly $1,000 in diesel to get here, and I was remarkably close, with the true diesel costs for the 4700 mile trip coming in around $1300. We also knew we would need to stock up on food this month, but weren’t planning on having to go twice for big stock-ups in May, and those visits alone added up to around $800. We went right before we hit the Canadian border and then again on May 31st because of the way our days off fell. I won’t truly know how it all evens out until we can take a 5 month average for food costs in September. And we were not planning on having our shackle strap break and to need to upgrade our suspension which ran $747. So, it was a rough month all around with our spend at an all time high of $5959.15. However, if you take those three items out of the mix we actually had a very good month, spending around $3202. Campground Fees – Once again, super happy with this category. Despite staying in full hookup campgrounds (for the WiFi) as we traveled, we were way under budget in this category. This will be close to zero for the next few months which is a major help with the budget. Dining Out (Fuel) – With the hectic travel schedule we did eat out a little more than we should have and the trip to Anchorage at the end of the month also cost us money in food for two meals. We need to think that through the next time we go and at least bring one meal with us. Memberships – The $195 is our AMEX card membership which earns us points whenever we use it, and double points when we buy groceries and fuel. Thus far the benefits have outweighed the costs, for example, when we use it in Canada, they do not charge a fee for the currency conversion, whereas Bank of America charged 3%, and the AmEx conversion rate is the best we found. Entertainment – We were well under budget for a change in this category because with the fast pace we didn’t do much on the way here. I do give us some credit though because we could have bought our way through Canada and didn’t do that. Storage – One last thing, we are now only paying $20 a month for this as the kids are splitting the cost with us three ways. So that’s nice. On a side note I wanted to mention we have earned $184.76 since January 1st through the Amazon Affiliate program for this website and we are very thankful for everyone who has ordered something using our Search Amazon.com here link. It doesn’t cost you anything extra, and once you reach the Amazon page you can log into your account and then order anything you would like. We are using that money to help to mitigate the higher Alaska food costs, by ordering what we can through Amazon Prime. I thought you might like to know how much we have earned through that program, and where it is going, and I wanted to say I really appreciate anyone who has made a purchase through this website! 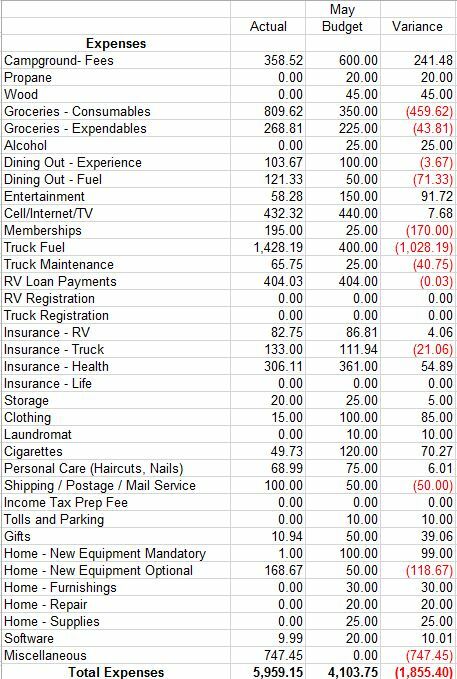 This entry was posted in Lakeside and tagged Full timing budget, RV travel to Alaska Budget. Bookmark the permalink. That’s so sweet. Thanks very much, we really appreciate it. Bill just finished our trip up – I’m going to post this week about it – we did better than expected budget wise – which is very nice! I haven’t tallied our expenses yet, and I lost the envelope with all our receipts from week three. I have no idea what could have happened to it! That means going online and piecing it all together. I am so bummed about that!